VATICAN CITY (CNS) — Ensuring small patients at a Vatican-owned hospital could keep an Italian Easter tradition, Pope Francis donated 150 brightly wrapped chocolate Easter eggs to children, including those undergoing cancer treatment, at the Bambino Gesu pediatric hospital near the Vatican. The pope also had 200 food packets — containing milk, olive oil, pasta, fruit, jam and salt — delivered to poor families in Rome’s Tor Bella Monaca suburb. Archbishop Konrad Krajewski, the papal almoner, and Msgr. 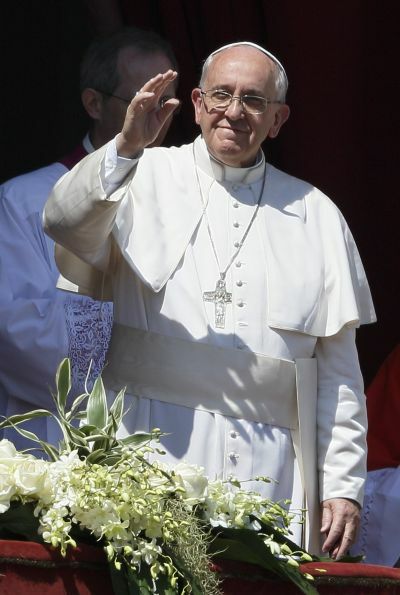 Diego Ravelli, from the office of papal charities, offered 100 homeless people in the city an Easter card signed by Pope Francis in an envelope that included an undisclosed gift of financial aid, reportedly of 40 euros ($55) or 50 euros ($69). A similar card and money also were given to 30 women living at the Casa Dono di Maria in the Vatican, a shelter run by the Missionaries of Charity, the order founded by Blessed Teresa of Kolkata. Archbishop Krajewski told an Italian reporter that some of the homeless men he had met April 18 while distributing the papal gifts were already preparing cardboard beds for the night outdoors. On opening the envelopes, “They began to dance with joy and to thank the Lord,” he related. At Christmas, the pope had given homeless people in Rome phone cards and bus and subway tickets. Two years ago, an Italian chocolate maker had donated a gigantic, 550-pound chocolate Easter egg to Pope Benedict XVI, which he in turn donated to a juvenile detention center in Rome.